Titanite is calming, balancing and stabilises moods and emotions. It supports the immune system, acts as a general all-round healing crystal, and especially promotes healing of sinus problems and bone and soft tissue damage. Spiritually, it aids the gentle opening and clearing of the Third Eye and Crown Chakras, allowing for further spiritual growth, and emotionally does the same with the Heart Chakra, releasing stagnant emotions and sadness. Also known as sphene, although the name is not as commonly used. 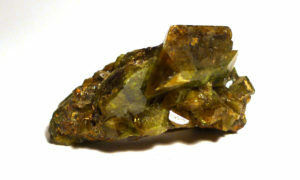 Titanite is an accessory mineral in igneous rocks, found in schists, gneisses and other metamorphic rocks, and as a detrital mineral in some sedimentary deposits. It has a wide colour range, due to other chemical elements that can substitute within the structure. It may contain significant amounts of iron, and smaller amounts of thorium and uranium, as well as tin, aluminium and others. It is one of the few minerals with a higher colour dispersion than diamond, and would probably be highly valued as a gemstone if not for its brittleness.